If I hadn't declared enough that I love Neil Gaiman, then I will reiterate: I love Neil Gaiman. He rocks my world. 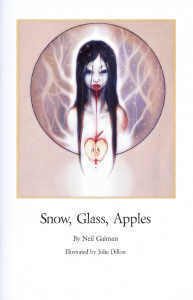 The short story Snow, Glass, Apples is a retelling of the beloved children's tale, Snow White and The Seven Dwarfs, from the point of view of Snow White's wicked stepmother-queen. The narrative is a flashback, commencing from the story of how the Wicked Stepmother-Queen met Snow White's father, the King, telling how their courtship progressed and how everything culminated to their wedding, and of course, recounting their life in the castle, and all else that transpired thereafter. More than the simple and candid writing, I enjoyed how Neil Gaiman gave a perverted and yet, deeply piquant and imagery-provoking twist to the fairy tale that every child – especially the princess-loving little girls, with their standard princess prototype in mind – has grown to love. Oh, all the major characters were present, all the important objects – mirror, apples in a basket, poison – were there, but Neil Gaiman deftly and brilliantly turned everything around in such a way that, well, it just blew me away. Suffice it to say that after reading this short story, one may never look at Snow White – or the seven dwarfs, who were but mere secondary characters in this retelling – the same way ever again. In the same vein, the Wicked Stepmother-Queen may just turn out to be not so wicked, after all. I still haven't read any Gaiman. I wonder where I should start. Fragile Things? There is a group read going on for that for Halloween. Btw, found your blog via Kyusi Reader. Now following you. Hi Mrs. B! Thanks for dropping by! I think that in order to ease yourself into Gaiman's work, you have to start with the short story compendiums like M is for Magic, Smoke and Mirrors, and yes, Fragile Things. Some people find his writing and ideas too weird for their taste, but it only takes some getting used to. At least, with the short stories, if you find one that's not to your liking, you can opt to choose another one, or drop it altogether. I won't recommend starting with his full-length novels like American Gods, although Stardust is probably a light read for most.